Dumbleton Hall is a traditional Cotswold Manor House set in 19 acres of private gardens and woodland with it's own private lake, complete with a pair of black swans. From a wedding photographer's point of view, Dumbleton Hall is a cracking venue. The panelled room where the wedding ceremonies take place is set up in such a way that the bride and groom get married in front of a huge bay window that provides loads of soft natural light. There's acres of grounds and gardens to explore, a huge lake, and one of my favourite things at the venue is the mile long driveway that afford you an excellent view of the hotel and it's surroundings. Ceri and Jack got married at a local church in Worcester, before moving to Dumbleton hall for their wedding reception and photographs. 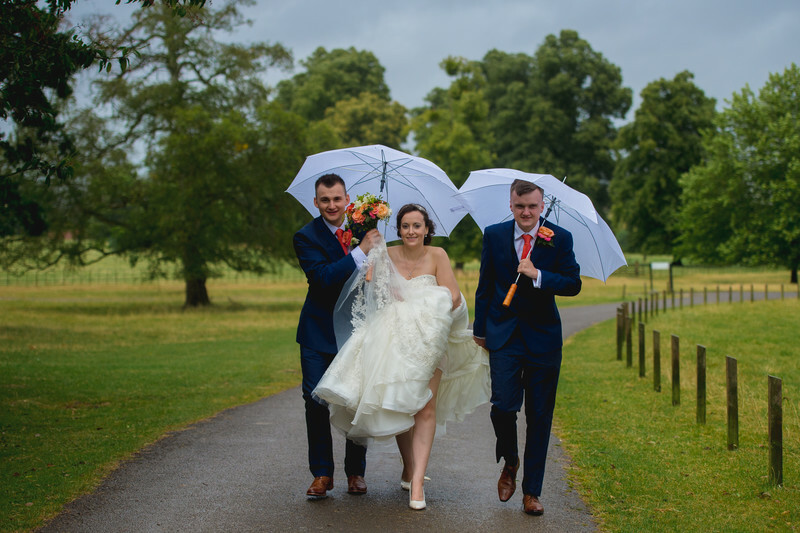 The weather on the day was really mixed, with a light shower earlier in the day, during the wedding ceremony and then a dry spell on the way to the reception venue. Due to a heavy rainfall on our arrival, we opted to take the formal photos inside with my lighting equipment. Despite not being able to take the photos outside, they certainly didn't suffer for it. We decided it would be best to head back to Dumbleton Hall as the rain was still getting heavier. I ran ahead of the bride, groom and best man to grab this photo as they walked towards the Hall.